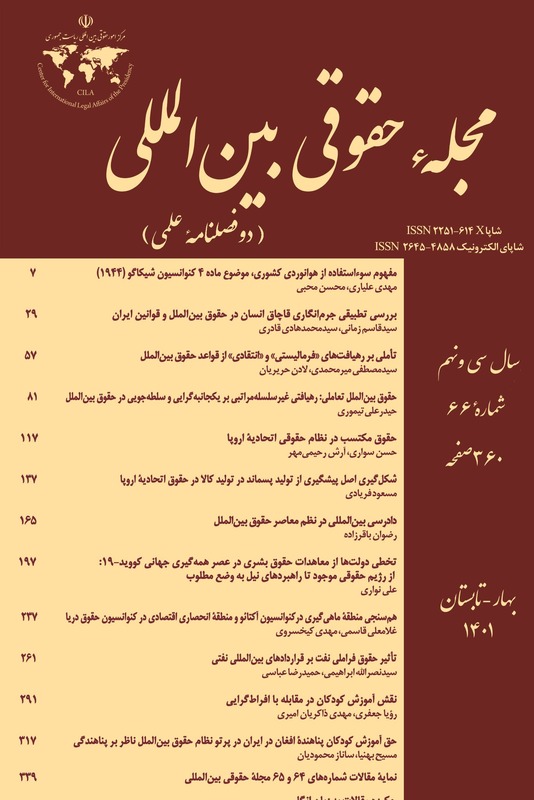 در قلمرو دکترین حقوقی بین‌المللی، رویکردهای متفاوتی نسبت به مفهوم بشریت وجود دارد. هریک از این نگرش‌ها در خصوص جایگاه و کارکرد مفهوم بشریت در حقوق بین‌الملل، داوری‌های متفاوتی دارند. در این میان، دیوان بین‌المللی دادگستری که در چارچوب تحلیل‌های خود از روش‌های فنی حقوقی بهره می‌گیرد، در روشن‌ترکردن زوایای پنهان مفهوم بشریت در قالب حقوق موضوعه، سهم عمده‌ای ایفا می‌کند. برای دستیابی به این هدف به تحلیل محتوای رأی تنگه کورفو و سپس نظر مشورتی دیوان در قضیه مشروعیت تهدید به استفاده یا استفاده از سلاح هسته‌ای پرداخته خواهد شد تا رویکرد دیوان نسبت به مفهوم بشریت، ارزیابی و صورت‌های موضوعه آن تبیین شود. سپس سهم دیوان در بروز و ظهوربخشیدن به جلوه‌های مختلف بشریت، از جستجوی آن در منابع گرفته تا ارزش برابری، بررسی خواهد شد. در این راستا پس از بیان مقدماتی در خصوص قابلیت‌های مفهوم‌شناسی حقوقیِ مفهوم بشریت در حقوق بین‌الملل، سهم دیوان در روشن‌کردن این قابلیت‌­ها در جریان برخورد با وقایع عینی مطالعه خواهد شد. There are different approaches towards the concept of humanity in the ambit of current doctrine of international law; diversity of ideas in these approaches leads to different evaluations of statues and function of the concept of humanity in international law. Meanwhile, International Court of Justice (ICJ) makes a major contribution to clarify hidden and vague features of the concept through analyzing cases by applying legal dogmatic method. To this end, this survey concentrates on ICJ approach toward humanity with furnishing the discussion on content analysis of Corfu Channel case and Legality of Threat or Use of Nuclear Weapon case to acquire positivistic manifestation. Finally, we will indulge on ICJ’s contribution regarding the concept of humanity and its manifestations in international law, as a survey in the sources of law to equality as an international value. All efforts in this study are centered on legal potentials of the concept of humanity in international law that ICJ has strived to clarify while encountering different sets of facts. تیبیت، مارک؛ فلسفه حقوق، ترجمه: حسن رضایی خاوری، مؤسسه فرهنگی قدس، مشهد، چاپ دوم، 1386. کاتوزیان، ناصر؛ مسئولیت مدنی ـ ضمان قهری، انتشارات دانشگاه تهران، 1370. ویکس، ریموند؛ فلسفه حقوق: از حقوق طبیعی تا پسامدرنیسم، ترجمه: فاطمه آبیار، نشر رخ داد نو، 1389. قربان‌نیا، ناصر؛ اخلاق و حقوق بین‌الملل، سمت، 1378. •فلسفی، هدایت‌الله؛ تقریرات درس تحلیل محتوای آرای قضایی بین‌المللی، دوره دکترای حقوق بین‌الملل، دانشکده حقوق دانشگاه شهید بهشتی، سال تحصیلی 1389-1388. _____________؛ تقریرات درس متدولوژی، دوره دکترای حقوق بین‌الملل، دانشکده حقوق دانشگاه شهید بهشتی، سال تحصیلی 1392-1391. Antônio Augusto Cançado Trindade, International Law for Humankind: Towards a New Jus Gentium (I), General Course on Public International Law, vol. 316 (2005), Martinus Nijhoff Publishers, Leiden, 2006. Diderot, D., Volume 5 Encyclopedie, in J. Mason & R. Wokler (eds.) Diderot, Political Writings, Cambridge: Cambridge University Press, 1992. Ellis, Joseph, American Creation: Triumphs and Tragedies in the Founding of the Republic, House Large Print,2007. Jørgensen, N. H. B., The Responsibility of States for International Crimes, Oxford University Press, 2003. Gordon-Reed, Annette,The Hemingses of Monticello: An American Family, W. W. Norton & Company, New York,2008. Goodwin-Gil, G. and J. Mc. Adam, The Refugee in International Law, Oxford University Press, 2010. Lauterpacht, H., International Law and Human Rights, New York: F. A. Praeger, 1950. Mosler, H. The International Society as a Legal Community, Recueil des Cours 140, 1974. Waldock, H.,General Course on Public International Law, Recueil des Cours 106, 1962. Blondel, J. L., “The Meaning of the Word “Humanitarian” in Relation to the Fundamental Principles of the Red Cross and Red Crescent”, IRRC, No. 273, November-December 1989. Cassese, Antonio, “The Martens Clause: Half a Loaf or Simply Pie in the Sky?”, European Journal of International Law 11, 2000. Chetail, Vincent, “The Contribution of the International Court of Justice to International Humanitarian Law”, IRRC, June 2003 vol. 85, No. 850. Coupland, Robin, “Humanity: What Is It and How Does It Influence International Law?”, IRRC,vol. 83, No 844. Dec. 2001. Kidd White, Emily, “Humanity as the A and Ω of Sovereignty: Four Replies to Anne Peters”, EJIL,vol. 20, no. 3, 2009. Kooijmans, Pieter, “The ICJ in the 21st Century: Judicial Restraint, Judicial Activism, or Proactive Judicial Policy”, International and Comparative Law Quarterly, vol. 56, 2007. Motataianu, Stefan, “The Hierarchy of the Norms in the International Law System”, Masaryk University, 2009. Meron, Theodor, “The Martens Clause, “Principle of Humanity and Dictates of Public Conscience””, AJIL, vol. 94, No.1, 2000. Simma, Bruno, “Universality of International Law from the Perspective of a Practitioner”, EJIL, vol. 20 No. 2. 2009. Peters, Anne, “Humanity as the A and Ω of Sovereignty”, European Journal of International Law 20, 2009. Posner, Eric A., “Erga OmnesNorms, Institutionalization, and Constitutionalism in International Law”, The Law School of The University of Chicago, Public Law and Legal Theory Working Paper, No. 224, August 2008. Zagor, Matthew, “Elementary Considerations of Humanity”, ANU College of Law Research Paper, No. 12-19, 2012. Corfu Channel (United Kingdom v. Albania), ICJ, Judgment of 15 December 1949. Legality of the Threat or Use of Nuclear Weapons, Advisory Opinion, ICJ Reports 1996. Military and Paramilitary Activities in and against Nicaragua (Nicaragua v. United States), ICJ, Judgment, ICJ Reports, 1986. Responsibilite de l’Allemange a raison des dommages causes dans les colonies portuguaises du sud de l’Afrique, 2 R.I.A.A. 1013, 1226 (1928). South West Africa (Ethiopia v. South Africa; Liberia v. South Africa) (Second Phase), ICJ Reports 1966. Western Sahara, Advisory Opinion, I.C.J. Reports 1975.
International Court of Justice (ICJ), Case concerning the Gabcíkovo-Nagymaros Project (Hungary/Slovakia). Judgment. 25 September 1997.
International Tribunal for the Law of the Sea (ITLOS), Request for an Advisory Opinion Submitted by the Sub-Regional Fisheries Commission (SRFC), 2014. Prosecutor v. Tadic, ICTY, IT-94-1-A72, Appeal on Jurisdiction, 2 October 1995, para. 97. Prosecutor v. Delalic, ICTY, IT-96-21-T, Judgment, 16 November 1998, para. 263.